Robert Morris was a wealthy merchant who was a signer of the Declaration of Independence, Articles of Confederation, and the Constitution along with a major financier of the Continental Army. In 1757, he and his business partner Thomas Willing established a successful international business dealing in shipping, real estate, and slavery. Mr. Morris was a delegate to both Continental Congresses and a member of the Secret Committee of Correspondence. The committee had the authority to set up an international trade system to procure arms and other goods. On September 12, 1776 Mr. Morris wrote a letter to Silas Deane, Esquire informing him that the Dutch islands, “at Curracoa M. Isaac Gouverneur will receive & forward Goods for us.” Isaac Gouverneur was a merchant on the Island of Curacao, located just north of Venezuela, who was appointed Commissary General of the army in the West Indies. Curacao, Thomas Jefferys, 1775. 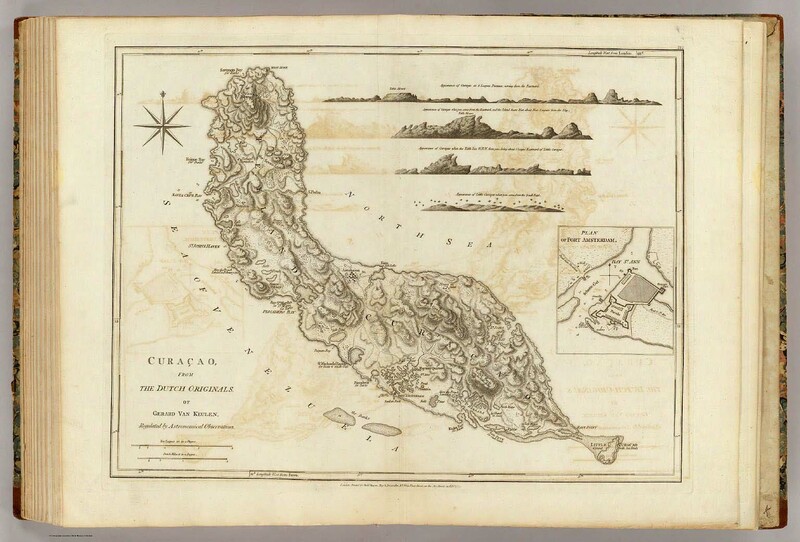 Image from David Rumsey Map Collection. 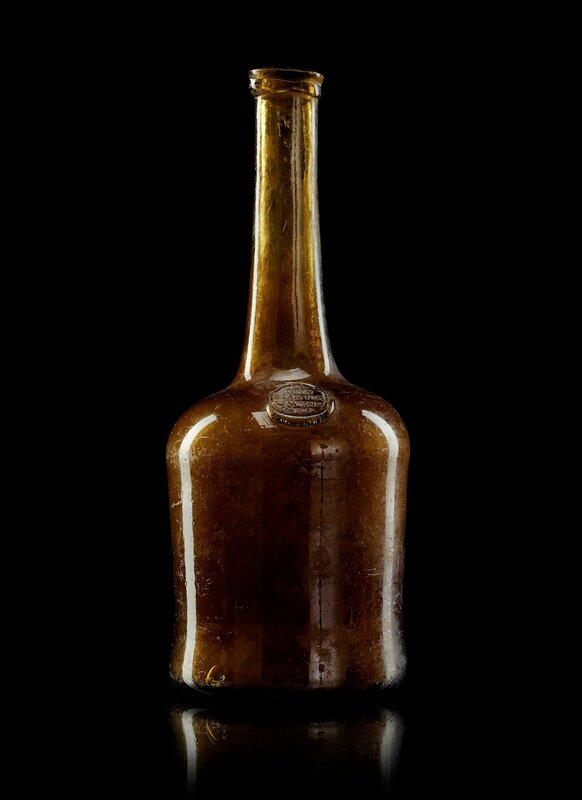 A glass wine bottle, marked ‘CON STANTIA WYN’, South Africa 18th/19th Century. Image from The Spring Classic Sale, Stockholm 574 Bukowskis Market. In December 1777 General George Washington’s army encamped at Valley Forge. In February 1778, Isaac Gouverneur sent a case of Constantia wine to Mr. Morris with instructions that the wine was to be given to General George Washington. I was honoured with yours of the 27th Ulto which needs no reply, I also rec’d your answer to what I had wrote respecting Colo. Armand & did not think it necessary to trouble you further on that Subject. Robert Morris was able to trade in wine for in March, 1778 he received at least two letters requesting wine. That of Chaplain Henry Miller of Colonel Stewart’s Regiment requesting, “enough wine to administer Communion to the members.”  The request of Colonel Matthias Slough was a bit more pressing, “It is with concern indeed I have to mention to you that I have at length found the bottom of my Wine Pipe, so that I have not a drop left to give to my friend.” Later that spring General George Washington received the case of Constantia wine and wrote a letter thanking both Mr. Morris and Mr. Gouverneur. I can find no other references to these bottles of Constantia wine. Your favor of the 9th Inst informed me of the acceptable present which your friend Mr Governeur( of Curracoa) was pleased to intend for me and for which he will through you accept my sincere thanks these are also due to you my good sir, for the kind Communication of the matter, and for the trouble you have had in ordering the Wine forward. I rejoice most sincerely with you on the glorious change in our prospects, Calmness and serenity, seems likely to succeed in some measure, those dark and tempestuous clouds which at times appeared ready to overwhelm us, The game, whether well or ill played hitherto, seems now to be verging fast to a favourable issue, and cannot I think be lost, unless we throw it away by too much supineness on the one hand, or impetuosity on the other, God forbid that either of these should happen at a time when we seem to be upon the point of reaping the fruits of our toil and labour, A stroke, and reverse, under such circumstances would be doubly distressing. Constantia wine has its origins in 1685 when the Governor of the Cape, Simon van der Stel, established his famous vineyard. By 1709 he had planted some 70,000 vines. Simon van der Stel died in 1712. In 1716 the estate was split into three: the original homestead Groot Constantia, de Hoop op Constantia or Klein Constantia (Little Constantia), and Brevliet. Johannes Colyn ran the two Constantia vineyards simultaneously and with great success. The Dutch East India Company eventually took notice of this product from their colonies. In 1761 agreements were made between the Company and Jacobus van der Spuy, owner of Little Constantia, and Lambert Myburgh, owner of Constantia. They were to sell to the Company two-thirds of all the red and white wine produced. For Little Constantia the price was set at 31l. 5s. per legger of red white and 15l. 12s. 6.d for white wine. The remaining one-third of the wine could be sold to whomever at any price. Between 1772 and 1780 Cape wine was sent every year to the Netherlands. During this period annual exports averaged 15 leggers of Constantia wine and 93 leggers of common wine. In 1777 there was a severe drought preventing the export of any wheat but some Constantia wine was still sent. The Dutch Coloony of the Cape of Good Hope. Louis Delarochette, 1795. 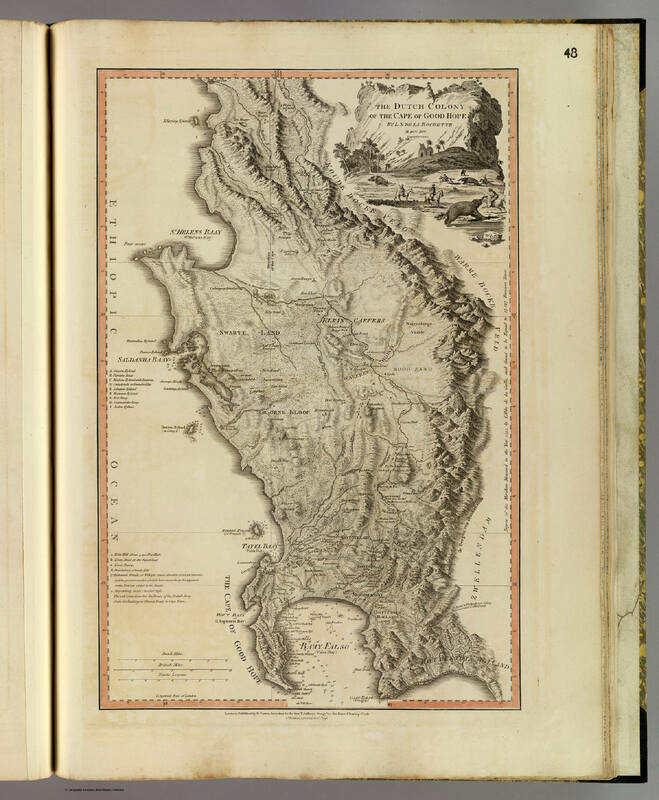 Image from the David Rumsey Map Collection. By 1778 the Constantia vineyard had fallen into disrepair. Hendrik Cloete focused on capital investment and energy into improving the estate and the wine. Francois Le Vaillant visited the vineyards of Constantia between 1781 and 1784. He notes that Mr. Cloete was an owner. A demi-haam of 80 bottles sold for 35-40 piastres but by his departure they sold for more than 100 piastres per demi-haam. Whether it was the disruption from the Anglo-Dutch War (1780-1784) or the rise in quality is not specified. I suspect it was the former for Hendrik Cloete wrote that no Constantia wine was sent in 1782 due to the war. Francois Le Vaillant continued that in the last seven or eight years the wines of Little Constantia had finally equalled that of Constantia and most recently had surpassed it. The wines of Little Constantia reached the best prices at the Company sales. As the two vineyards were only separated by a hedge it was the management that distinguished the wines. It is possible but unlikely that General George Washington was familiar with Constantia wine for it appears to be an uncommon wine. There is no mention of Constantia wine in The Pennsylvania Gazette though Commander James Child sold Cape wine in 1750. I find no mention of Constantia wine nor Cape wine in the index of the Virginia Gazette for 1736-1780. There is one 18th century instance of Constantia wine being transported to Philadelphia. In May 1774 the British merchant ship Severn heading from Bristol to Philadelphia sank off the coast of Delaware. Discovered in 2004, the wreckage contained wine bottle fragments including the glass seal bearing “CON STANTIA WYN …”. A complete bottle with a similar seal “CON STANTIA WYN” was found in the 1940s by a diver exploring off of Stockholm. Upon his death the bottle was bequeathed to the Historical Musem of Wine and Spirits in Stockholm where it was dated to the 1790s. Both of these bottles have been attributed to Groot Constantia. Constantia wine was available in London during this period. In November 1779 Mr. Skinner auctioned off “SEVEN CASKS of excellent CONSTANTIA WINE…of Captain CHARLES MEARS, a Bankrupt, late Commander of the Egmont East-Indiaman.”  Sixteen years later in March 1795, Messrs. Greenwoods sold it by the bottle. They had gotten hold of a small consignment imported in 1789 and 1790 by a gentleman from the East-Indies. It is possible that some Constantia wine made it to the American Colonies by way of English ship. There is no evidence that Thomas Jefferson ever purchased or drank Constantia though he mentioned Cape wine in 1788. How the case of Constantia wine got to Curacao is a mystery. The wine was sent from the Cape to the Netherlands in casks for sale so it is possible the wine was bottled in Europe. It is likely it followed the route of a Dutch East India ship from the Cape of Good Hope to the Netherlands followed by a Dutch West India ship to Curacao. Or perhaps some other merchant ship. The case of wine sent to General George Washington was simply identified as “Constantia Wyne”. The early writers were careful to distinguish between Constantia and Little Constantia as the two true sources of Constantia wine. At first inspection it appears that General George Washington may have received a case of Constantia wine from Constantia. However, this may not be the case. In 1772, Andrew Sparrman notes that the quantities of Constantia wine consumed in Europe exceeded what was produced by the two estates and that even in the Cape one had to be careful about drinking the true wine. David Collins noted that in 1787 the only wine they could taste in bottle was Constantia wine. He found it had “a very fine, rich, and pleasant flavour, and is an excellent cordial” but much of what is sold under the name was never made from the Constantia vineyards. A clue lives with Johan Splinter Stavorinus, Esquire who visited Constantia and Little Constantia in 1774. He writes that the Company maintained the exclusive right to sell the Constantia wine and also use the name. In response people sold an inferior wine known as “maag or stomach wine”. Hendrik Cloete writes in 1789 that as of 1780 the sellers of maagwijn (stomach wine) after selling one leaguers of wine to the Company, could sell the rest at any price whereas that of Constantia and Little Constantia were limited to a fixed price. Hendrik Cloete also notes that there was a great difference between stomach-wine and Constantia wine. Isaac Gouvernour describes the Constantia wine as “an Excellent Stomachick and Very Refreshing when Fatigued.” Stomachicks originated in the mid 17th century as an agent to improve digestion and increase appetite. In 1676 a type of green apple cider was recommended as a “stomach wine”. Stomach wine continues to appear in publication throughout the 18th century, such as an aid in withdrawing from a course of opium  or a diet-drink for chronic cases . The recommended stomach wines were comprised of cider, wine, infusions with wine, and compositions with wine made over many days. It seems likely then that Constantia wine received by General George Washington was not true Constantia but the lesser sort. It was recommended as a stomachick by Isaac Gouvernour because he had sent on stomach wine which was the common name for the inferior wine not sourced from the two Constantia vineyards. Secret Committee of Correspondence/ Committee for Foreign Affairs, 1775-1777. URL:http://history.state.gov/milestones/1776-1783/SecretCommittee Last Accessed: 03 July 2013. Collections of the New York Historical Society, Volume 19. New York, 1886. To George Washington from Robert Morris, 30 December 1776. URL:http://founders.archives.gov/documents/Washington/03-07-02-0384 Last Accessed: 03 July 2013. From George Washington to the Executive Committee of the Continental Congress, 1 January 1777. URL: http://founders.archives.gov/documents/Washington/03-07-02-0395 Last Accessed: 03 July 2013. To George Washington from Robert Morris, 9 May 1778. URL:http://founders.archives.gov/documents/Washington/03-15-02-0078 Last Accessed: 03 July 2013 . Henkels, Stan V. The Confidential Correspondence of Robert Morris, the Great Financier of the Revolution. Catalogue No. 1183. Philadelphia, 1917. Historical Papers and Addresses of the Lancaster County, Volume 24, No. 1. The New Era Printing Company, Lancaster, 1920. From George Washington to Robert Morris, 25 May 1778. URL: http://founders.archives.gov/documents/Washington/03-15-02-0223 Last Accessed: 03 July 2013 . Theal, George McCall. History of South Africa Under the Administration of the Dutch East India Company, Volume 2. London, 1897.
 de Saint-Pierre, Bernardin. A voyage to the Isle of Mauritius, the Isle of Bourbon, The Cape of Good-Hope, &c. London, 1775. Sparrman, Andrew. A voyage to the Cape of Good Hope, Volume 1. London, 1785. Virginia Gazette. URL:http://research.history.org/DigitalLibrary/BrowseVG.cfm Last Accessed: 02 July 2013. The Pennsylvania Gazette; Date: 05-03-1750; Issue: 1116; Page: ; Location: Philadelphia, Pennsylvania. Early American Newspapers Series 2, 1758-1900 and Selected Historical Newspapers. Constantia Wine. URL: http://www.monticello.org/site/research-and-collections/constantia-wine . Last accessed: 02 July 2013. Collins, David. An Account of the English Colony in New South Wales. London, 1798. Stavorinus, John Splinter. Voyages to the East-Indies, Volume II. London, 1798. Schutte, G.J. Hendrik Cloete, Groot Constantia and the VOC 1778-1799. Paarl, 2003. Leibbrandt, H. C. V. Precis of the archives of the Cape of Good Hope, Volume 1. Cape Town, 1905. The Royal Society of London. Philosophical Transactions of the Royal Society of London, Volume XI. London, 1676. Jones, John. The Mysteries of Opium Revealed. London, 1701. Quincy, John. Pharmacopoeia Officinalis Extemporanea. London, 1782. Fascinating stuff! Thank you for posting this! However, I’ve been delving into the history of Constantia recently, and I wouldn’t be so quick to write off George Washington’s “Constantia wine” as a “stomach wine”. Born and raised in South Africa, where I make a living as a wine writer, I have only ever known the term “maagwyn” or “stomach wine” to have been used in a derogatory way (the suggestion by Stavorinus that producers CHOSE the term is highly unlikely, but I intend to investigate this further…). Personally, I can’t imagine that Isaac Gouverneur would have bothered with the Cape’s inferior “stomach wines” at all, or that Morris would have gone through so much “trouble” to get them to Washington (a man he greatly admired, and to whom he had stressed that the wine procured previously was “a good one”). When Gouverneur describes the Constantia wine as “an Excellent Stomachick”, I think he is genuinely praising its digestive properties rather than suggesting that it isn’t the genuine article. Thank you very much for reading my post and commenting. These bottles are an interesting subject because if they contained true Constantia then it appears they are the first documented bottles of Constantia to reach American land. I do not know much about the history of maagwijn so Groot Constantia is further researching its use by Hendrik Cloete. From what I have read of 18th century English documentation, stomach-wines were a respected category of wine. It is interesting that the maagwijn/stomach-wine terms are still used in South Africa and have a derogatory connotation. I have not come across an 18th century reference describing Constantia as a stomach-wine or simply beneficial to the stomach in any way, so I’d appreciate any references that you have. For me the careful distinction between Constantia and maagwijn coupled with the fact that Isaac Gouverneur sent the wine from a Dutch colony cast some doubt. I certainly agree it is possible that George Washington received the real thing and that Isaac Gouvernour was simply praising the qualities of the wine. Or Isaac Gouvernour was confused and attributed the name of maagwijn as a quality of Constantia. One of the reasons I write such posts is to solicit responses such as yours so that I may refine or correct the post in the future. Let me know what you find out about Stavorinus, I think the maagwijn itself would make for interesting research. Given that Curacao was a Dutch colony (like the Cape, which only came under British administration in 1795), I think genuine DEIC-procured Constantia could have been on any DEIC ship that called at the Cape prior to making its way towards South America…? …‘Still I must try and eat something,’ he sighed, – and he proceeded to soak a biscuit in a glass of old JP Cloete, a few bottles of which were still left in his cellar.